Gendarmenmarkt Berlin mit dem WissenschaftsForum (Eckgebäude), das von der VolkswagenStiftung im Rahmen ihrer Vermögensanlage errichtet wurde. The WissenschaftsForum Berlin (WFB) at Gendarmenmarkt in downtown Berlin is a very special address. This is where a great many research organizations from all over Germany have chosen to locate their Berlin offices. They are not only able to make mutual use of the building’s infrastructure, like meeting and conference rooms for example; being in close proximity to the neighboring Berlin-Brandenburgische Akademie der Wissenschaften is also a locational advantage for WFB. The WissenschaftsForum Berlin owes its existence to an intiative on the part of local government, the Berlin Senate, who encouraged the Volkswagen Foundation to create a permanent forum for the large German research organizations in the country’s new capital city. 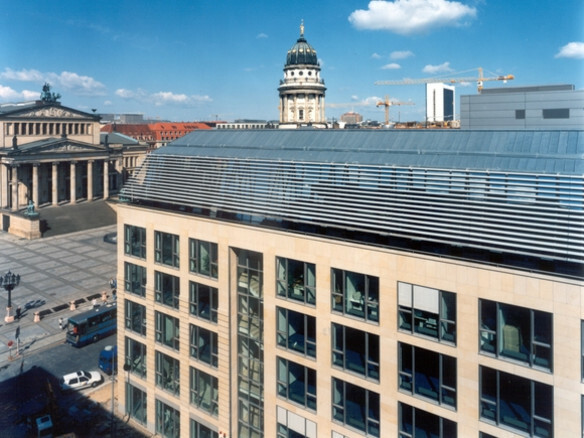 The Foundation acted on this idea via its subsidiary IVA KG and set up the WFB at Gendarmenmarkt within the framework of its asset investments. The building was inaugurated in May 1999. The Foundation also has an office there; it does not, though, maintain a staffed branch office. Incidentally, the building not only houses offices. On the ground floor, visitors will find shops and a restaurant. The homepage of the WissenschaftsForum Berlin gives an overview of the institutions established in the WFB.